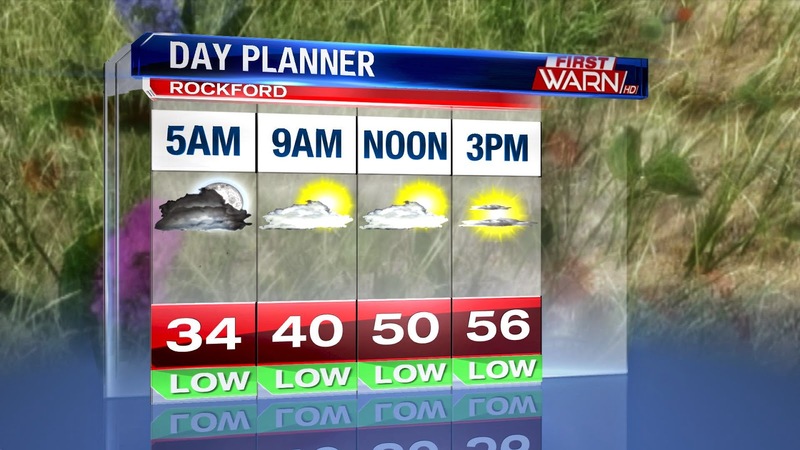 It was another spring-like day across the Stateline today, but tomorrow's forecast gets even better. Southerly winds pick up ahead of our next low pressure system, bringing warmth into the area tomorrow. You can see the warmth building to the west with highs in the 80s in Wichita and upper 70s in Iowa. It won't get quite that warm tomorrow, but highs in the upper 60s and low 70s will be possible. 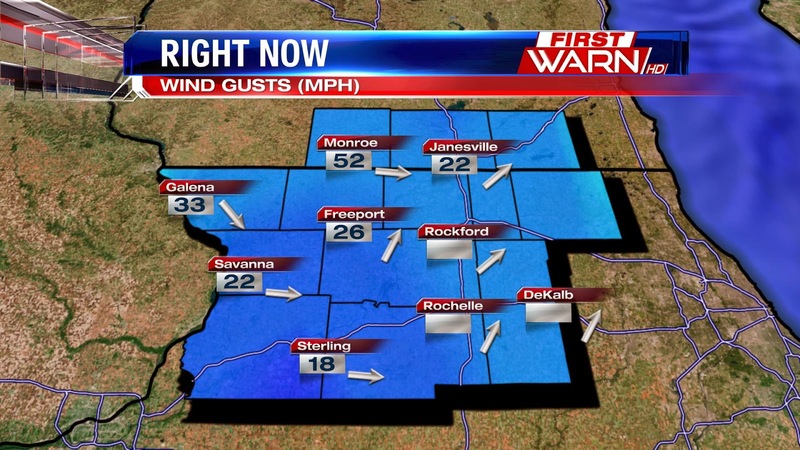 Winds will be strong at times through the afternoon, gusting up to 30mph. And with the warmth comes the chance for rain and thunderstorms, that arrives late Wednesday night and Thursday along a cold front. Dry air works in Thursday bringing an end to the rain. Southerly winds ahead of low pressure Wednesday afternoon will give temperatures a boost into the middle and upper 60's - possibly low 70's! Strong low pressure will move across the northern Plains during the day Wednesday pulling a cold front through. This front will be the focus for thunderstorms from Minnesota to Iowa and towards Kansas and Nebraska during the day Wednesday. That cold front will move into western Illinois early Thursday morning. Not the most favorable time for thunderstorms, but any warmth building ahead of the front Thursday afternoon could fire off additional storms near the Stateline. By Friday, the cold front will have settled south, but could be just close enough to produce a few chilly showers during the day. Surface winds will shift around to the east which will push a cooler air mass throughout the northern Illinois and southern Wisconsin. Temperatures will go from the 60's on Thursday down into the upper 40's on Friday. Temperatures will be cooler Saturday with highs in the low 50's under partly cloudy skies. Winds will then shift around to the south late Saturday pulling a warm front through Easter morning. Temperatures are expected to fall into the low 30's Saturday night, and if precipitation begins to fall early enough, a wintry mix could occur before switching over to a chilly rain during the day. Incoming cloud cover behind low pressure has allowed dense fog to develop. That fog is now moving into southern Wisconsin and northern Illinois. 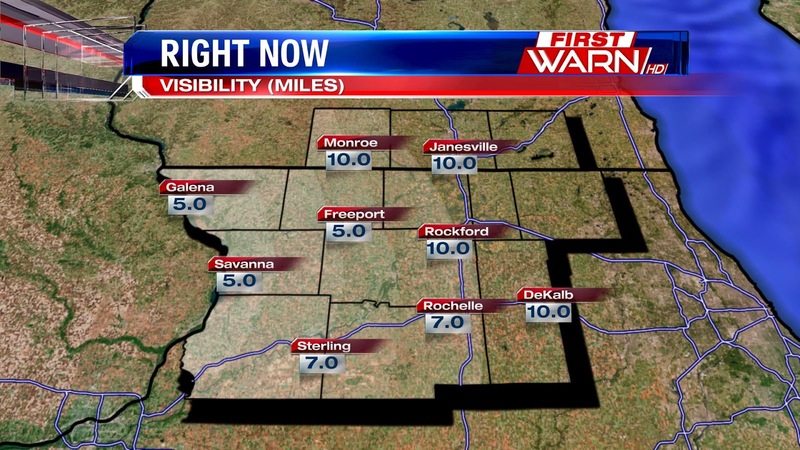 Visibility in Monroe and DeKalb has fallen under a mile. The dense fog will last through roughly 10am, so use caution while driving. Skies will turn partly cloudy this afternoon with temperatures climbing into the middle and upper 50's. March will go out like a lion for some in the Midwest with the possibility of severe weather late Wednesday afternoon and evening. It's not going to be a major factor for us, but for areas from Fairmont, MN down through Des Moines, IA and out towards Omaha and Lincoln, NE could experience strong thunderstorms producing hail and gusty winds late Wednesday. Strong south winds will not only bring 70 and 80 degree weather up through the Plains and Midwest, but also an increase in moisture. 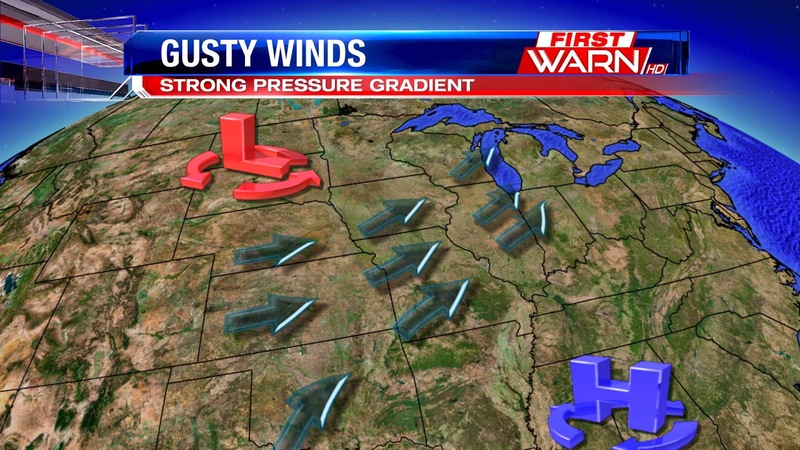 A strong low pressure system will pull a cold front through the central Plains Wednesday afternoon. 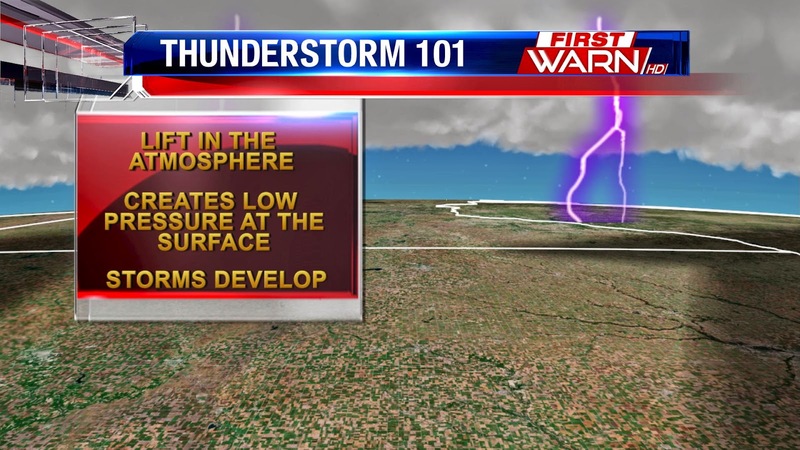 Ahead of the front, thunderstorms will be likely as they interact with a strong jet stream and low level jet overhead. Those thunderstorms could form into a squall line and shift east overnight Wednesday. Scattered showers and thunderstorms will be possible for northern Illinois and southern Wisconsin after 10pm, but the severe threat will remain low for us. Now that the weather will start to feel a little more like spring, why not learn all you need to know about severe weather. The next severe storm spotter training class will be tomorrow, Tuesday, March 31st at 6pm. Head on out to the Cherry Valley Fire Protection District on Blackhawk Rd in Rockford, IL. The class is open and free to the public and runs roughly two hours. While there, you'll learn about storm structure, how storms development, what storms are most frequent to this area, cloud features and other environmental clues to identify severe storms and tornadoes. Communications systems and spotter networks are also explained so the spotter knows where to report, and how that information is used by the National Weather Service and local officials. 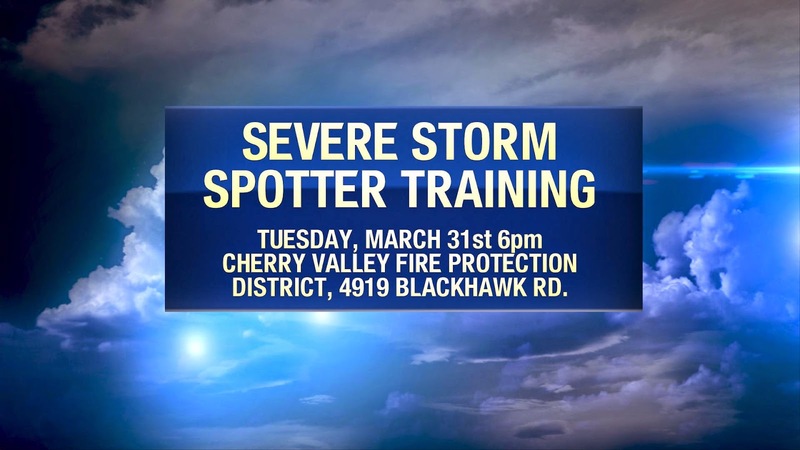 So if you're interested in becoming a trained spotter with the National Weather Service, head out to the Cherry Valley Fire Protection District tomorrow evening. Get there early because the seats will fill up fast! Temperatures today were holding steady in the 30s for a good part of the day with thick cloud cover in place. Winds in the afternoon really picked up behind a cold front, gusting up to 52mph in Monroe, Wisconsin! Temperatures Saturday topped out in the upper 30's and low 40's. Not bad even if it was below average. That's all about to change Sunday as strong southwest winds will bring in somewhat of a warmer air mass, but it's not necessarily going to feel all that warmer on Sunday. Strong low pressure will remain tied to the U.S/Canadian border Sunday afternoon. 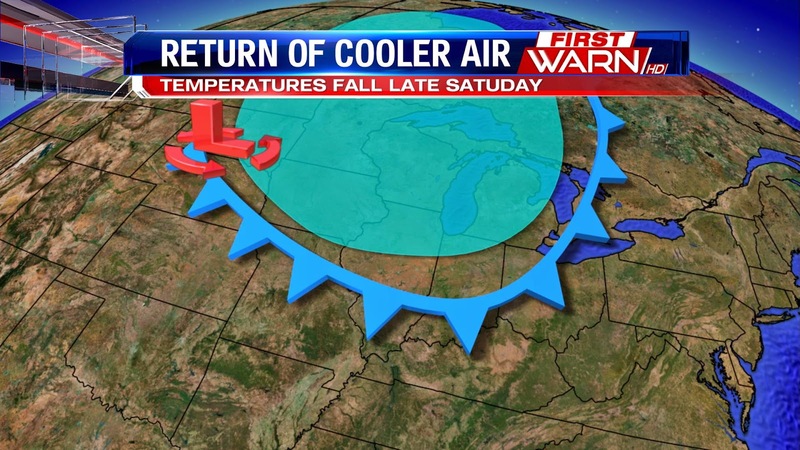 A warm front will lift through southern Wisconsin and northern Illinois, followed then by a cold front Sunday evening. Moisture will increase some Sunday morning ahead of the warm front and this could lead to a quick burst of a wintry mix - sleet, freezing rain & snow - between 6am and 9am, before switching over to all rain mid-morning Sunday. Heads up if you're going to be traveling early on Sunday. Wind gusts by Sunday morning will already be approaching 30 mph and will increase through the afternoon with gusts close to 40 mph. 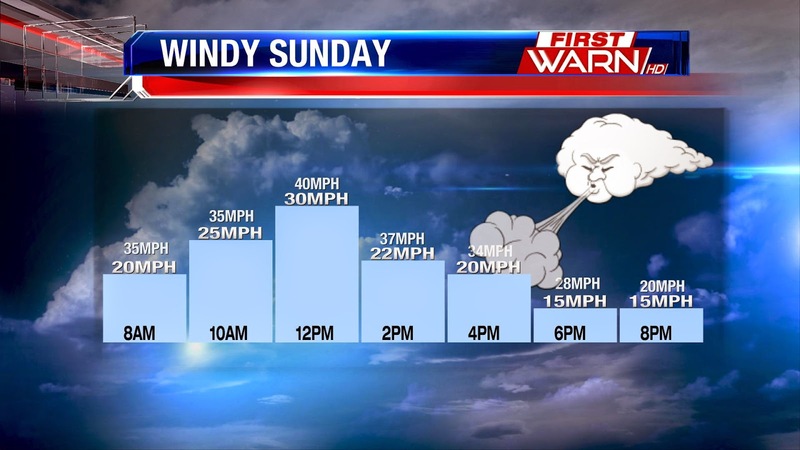 The wind will ease a little once the cold front passes Sunday evening, but there will still be an occasional wind gust near 20 mph through 8pm Sunday night. While the surface low pressure will be far away from the Stateline, there may be just enough energy in the atmosphere to generate a thunderstorm or two midday Sunday. So, keep your ears open for that. The start of next week won't be nearly as windy, and temperatures will warm into the low to middle 50s - closer to average for this time of year. It may not seem like it, but soon we'll be trading in the recent snow for springtime showers and thunderstorms. And with the recent severe weather in the Plains the past couple of days, I wanted to discuss a little more on how thunderstorms form, and the frequency of tornadoes in Illinois. Just like the interstate you drive on to get you where you need to go, the jet stream acts like an interstate for storm systems. Since the jet stream flows from west to east, storms typically track from west to east. While there are a lot of factors that contribute to the development and strength of thunderstorms - like lift in the atmosphere, moisture and instability - the strength of the wind within the jet stream is a major factor. Higher wind speeds within the jet stream are called 'jet streaks'. And it's those jet streaks that can help enhance thunderstorm development. Going back to the interstate thought, when you come up to a construction zone on the highway, you slow down. When you get out of the construction zone, you speed up. Winds do pretty much the same as they round the ridges and troughs in the jet stream. As winds get closer to the dip, or trough, in the jet stream they tend to slow down. As winds round the base of the trough and come out on the other side, they speed up and spread out. This causes 'divergence' in the atmosphere, which causes lift throughout the atmosphere. Where that lift occurs, is where low pressure systems develop and thunderstorms form, and intensify, at the surface. Now, there also needs to be moisture (higher dew points) and instability, but if all comes together just at the right moment, severe weather can develop. 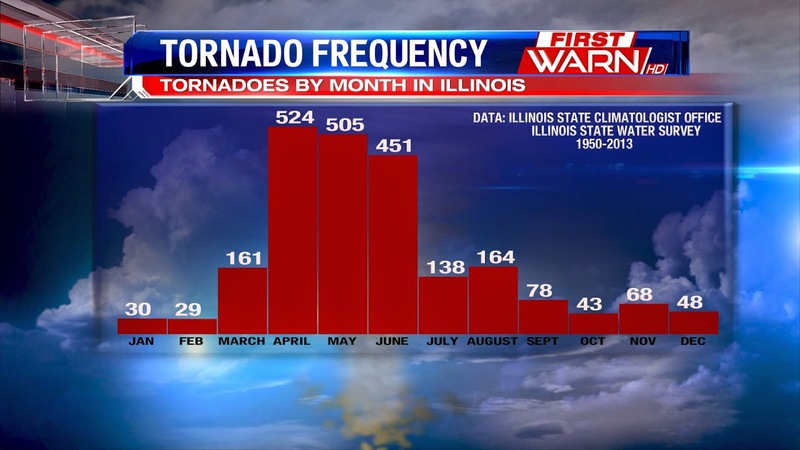 Since we're getting closer to severe weather season in northern Illinois and southern Wisconsin, I thought we should take a look at the frequency of tornadoes by month, as well as time of day. Tornadoes can occur any month of the year - remember the January 2008 and November 2011 tornadoes? 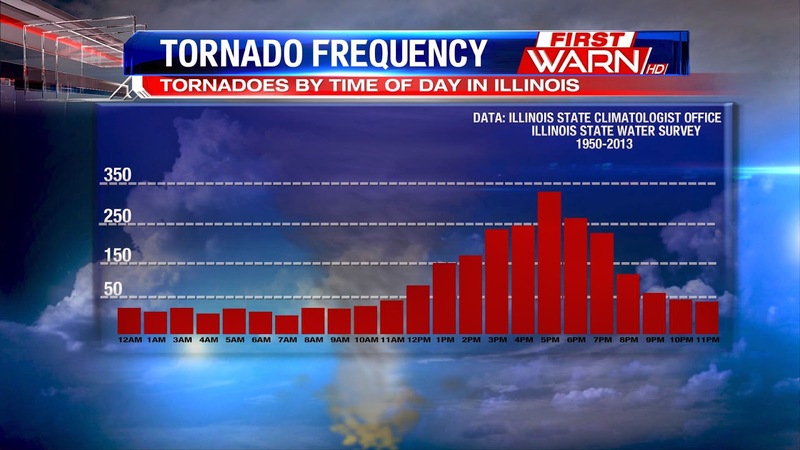 But, the months that experience the highest frequency of tornadoes throughout Illinois are April, May and June. This is as the jet stream shifts north, pulling warmer air with it. but most frequently we see them late in the afternoon and early evening. The reason: by that time we've maximized the amount of heating and instability (two ingredients needed for thunderstorms). However, tornadoes can occur any time of day and it's the ones that form during the 'off hours' of the early morning or overnight, that tend to be the most dangerous because people are either not aware that severe weather is occurring, or they're fast asleep and don't hear the warning. That's why it's so important to have a safety place in your house, know what to do when severe weather occurs and most importantly, have a way to receive warnings. Something that will wake you up in the middle of the night. Warmer weather will come, I promise you this. And as we transition into the warmer months, let's work to become better prepared for when severe weather occurs! It's a phrase we've become used to this winter season: Temperatures today will be near record cold. Unseasonably cold air continues to spill down through the Great Lakes as a very strong ridge of high pressure builds out west. Record highs are possible through the west, while record cold highs are possible closer to home. The record cold high for today is 31 degrees, set back in 1965. Today, I'm forecasting a high of 35 degrees. Below average weather will last through the weekend before temperatures climb into the low 60's by next week. We've had a few cold days this week, and that chill will last through the weekend. A strong ridge of high pressure will build out west with temperatures running nearly 15 to 25 degrees above average. 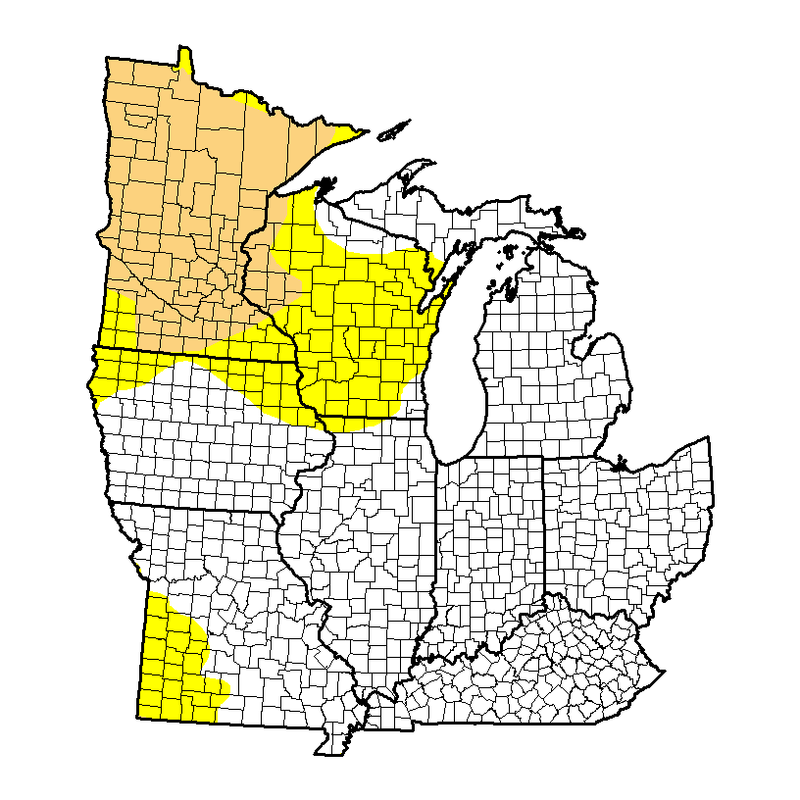 Unfortunately, this will do nothing to help the drought situation that continues to worsen out west. Just the opposite will happen through the Great Lakes and out east where highs will run almost 15 to 25 degrees below average. 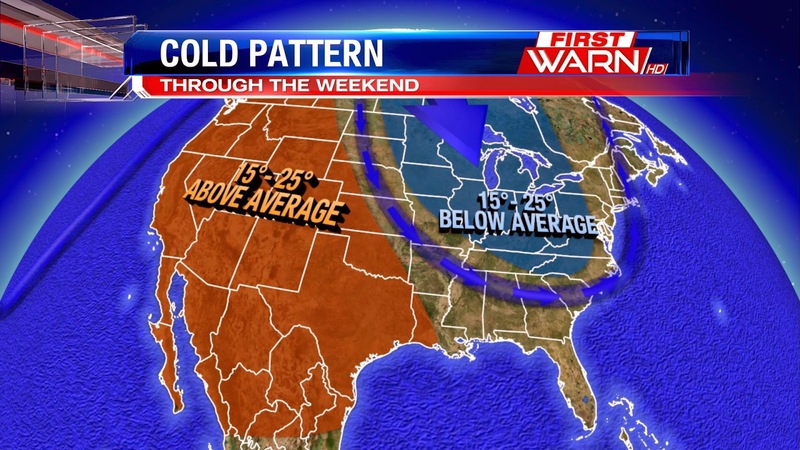 This pattern will stick around into the weekend, which will keep temperatures below average. A strong low pressure system will help to break down the ridge out west on Sunday. This low will also pull a cold front through, but the air mass behind the front will have come from the Pacific, rather than the north. This means temperatures into next week will begin to warm into the 50's, possibly breaking the 60 degree mark for the first of April. Hopefully this isn't an April Fool's joke by Mother Nature. As we head a little further into April, the jet stream will take on a more active, spring-like pattern with systems coming through every few days. The US Geological Survey confirmed that a small earthquake, 2.9 magnitude, was recorded near Lake in the Hills this evening. The quake occurred just after 6:00pm tonight in southern McHenry county. Lake in the Hills is about 40 miles to the south east from the Rockford area. There haven't been reports of any damage, but there are reports of some people feeling light shaking, and hearing rumbles in Rockford. While earthquakes in Illinois aren't common they do happen from time to time. In the past 100 years there have been at least 20 earthquakes in varying magnitudes. The USGS haven't noted a cause, but normally when there is an earthquake east of the Rockies, it's due to faulting in the bedrock miles deep. Did anyone hear or feel the earthquake this evening? A little bit of everything is possible with our next system Tuesday evening. As winds increase with the low level jet tonight, this could bring a few rumbles of thunder to Illinois overnight. The first round of showers moved through northern Illinois around dinner time, next round will come around 10pm and 11pm. The rain continues overnight and lasts through daybreak Wednesday morning, clearing out from west to east. Temperatures are hoovering close to the freezing mark, so along with the rain, freezing rain and sleet is also possible. Temperatures will warm after midnight though, and will help to decrease that threat. Looks like we could pick up about a half to three quarters of an inch of rain by tomorrow morning. There is a slight chance for another passing shower tomorrow afternoon. Clouds will clear for a bit early afternoon before increasing again a little later on. High temperatures will warm to either side of 50°. Don't worry, it's not for us! But, areas to the south could experience their first bout of severe weather later today and tomorrow. A fairly strong spring jet stream pattern has taken shape over the southern Rockies this morning. This will allow low pressure to develop in Oklahoma and pull northeast reaching northern Illinois tonight. Winds are currently from the east, but will increase from the southeast today ahead of a warm front. That front will pull a warm, moist air mass northward later today. Rain will overspread from south to north through the overnight, and with that could come a few rumbles of thunder. Further south in central & southern Illinois, Missouri and parts of Arkansas and Oklahoma are in for possible severe weather with hail, gusty winds and isolated tornadoes. Rainfall amounts could add up, as the biggest rainfall is expected since the end of last year. Totals between a quarter inch to half inch will be likely by Wednesday morning. Temperatures today and tonight will be key in determining just what type of precipitation will fall. Most of northern Illinois should experience rain, however, just over the border and further north in Wisconsin may experience more of a wintry mix through Wednesday morning. What a start to the work week and shock to the system! Heavy snow fell (at times 1-2" an hour) during the morning rush creating a big mess this morning. This is even more of a shock since last Monday we had sunny skies and highs in the mid 70s! Today only warmed into the lower 30s and with that came plenty of snow. 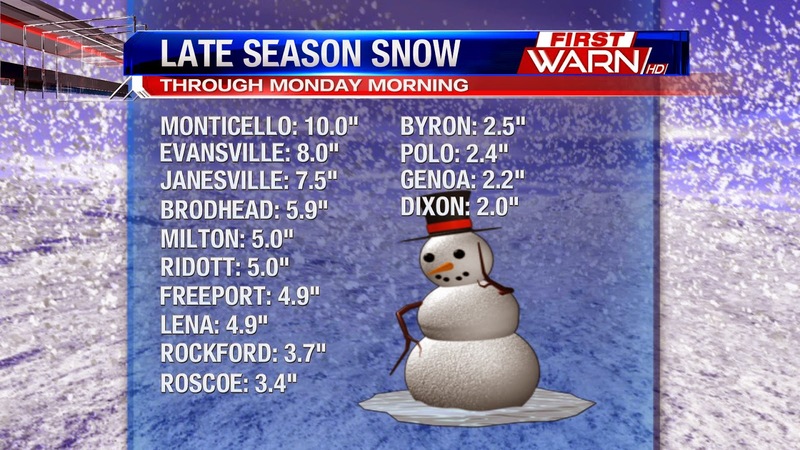 Rockford saw 5.1" of snow today, while areas like Monticello received 10 inches of the white stuff! This happened because the greatest lift from the low pressure system was centered over southwest Wisconsin. Farther south in Dixon, only saw 2.0". For Rockford, this was the highest daily snowfall after the first day of spring since 1982, and ranked in at 8th overall. 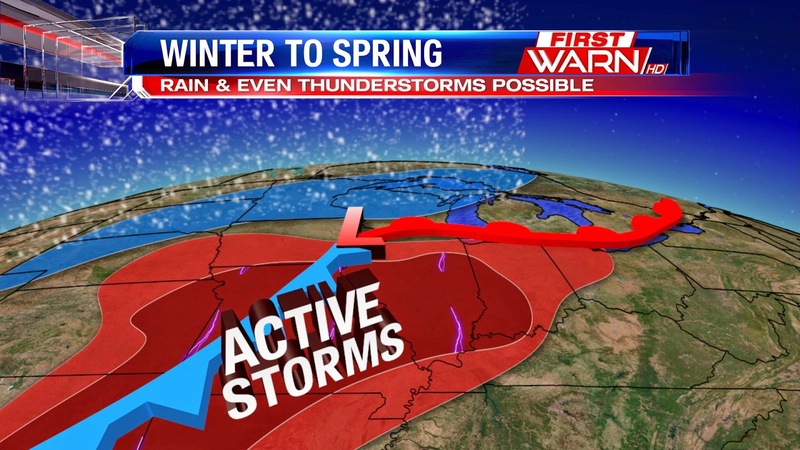 We all know spring in the Midwest changes quickly, from snow today to tracking rain for Tuesday evening. Tracking a low pressure system taking shape over the Rockies, this system will track to the north west and pass over the Stateline by Tuesday evening. An associated warm front will bring rain, with the possibility of thunder around 7pm Tuesday. The rain showers will continue through about 3am Wednesday morning. The dry slot of the system will work into the area Wednesday morning ending the rain. We hold onto the clouds Wednesday with highs in the lower 50s. 11:20am Update: Last bit of snow moving through the I-39 corridor in southern Wisconsin and northern Illinois. No additional accumulation is expected with this. Roads through the afternoon will remain sloppy, but should improve by this evening. 8:25am Update: Back edge of the snow is now moving into northwest Illinois and will continue to do so through 10am. 7:10am Update: Heavy snow falling along Highway 20 from Dubuque to Rockford. IDOT reporting US-20 is completely snow covered. Heavy snow is also found along I-88. This is the last burst of heavy snow we'll experience before tapering off after 9am. I can't stress it enough to slow down this morning. Roads are very slick under the several inches of snow that has fallen. Even with 4 wheel drive vehicles it's tough this morning. (8:51:13 AM) nwsbot: Local Storm Report by NWS DVN: 3 N Freeport [Stephenson Co, IL] trained spotter reports SNOW of M4.5 INCH at 08:50 AM CDT -- storm total snowfall. (8:27:17 AM) nwsbot: Local Storm Report by NWS MKX: Milton [Rock Co, WI] nws employee reports SNOW of M5.0 INCH at 08:00 AM CDT -- storm total snow through 8am. (8:25:20 AM) nwsbot: Local Storm Report by NWS DVN: 2 ESE Ridott [Stephenson Co, IL] trained spotter reports SNOW of M5.0 INCH at 08:24 AM CDT -- still snowing lightly. (7:53:06 AM) nwsbot: Local Storm Report by NWS MKX: Edgerton [Rock Co, WI] trained spotter reports SNOW of M6.2 INCH at 07:45 AM CDT -- storm total through 745am. light snow falling at the time. (7:14:41 AM) nwsbot: Local Storm Report by NWS DVN: Galena [Jo Daviess Co, IL] co-op observer reports SNOW of M2.0 INCH at 07:00 AM CDT -- still snowing. (7:33:39 AM) nwsbot: Local Storm Report by NWS DVN: 4 ENE Freeport [Stephenson Co, IL] trained spotter reports SNOW of M4.0 INCH at 07:32 AM CDT -- snowfall so far...still snowing. (7:38:32 AM) nwsbot: Local Storm Report by NWS LOT: Roscoe [Winnebago Co, IL] co-op observer reports SNOW of M3.4 INCH at 06:30 AM CDT -- total so far. (7:08:39 AM) nwsbot: Local Storm Report by NWS LOT: Rockford Airport [Winnebago Co, IL] official nws obs reports SNOW of M2.6 INCH at 06:00 AM CDT -- total so far. (7:43:01 AM) nwsbot: Local Storm Report by NWS MKX: Edgerton [Rock Co, WI] trained spotter reports SNOW of M3.4 INCH at 05:30 AM CDT -- storm total through 530am. heavy snow falling at the time. 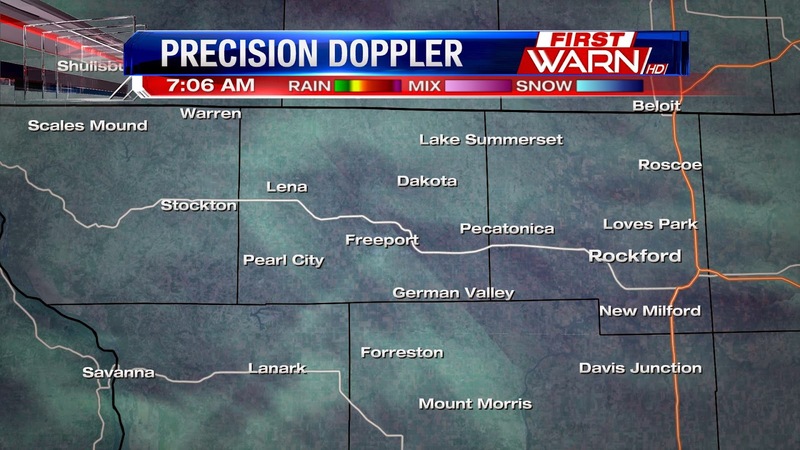 (7:26:44 AM) nwsbot: Local Storm Report by NWS MKX: Afton [Rock Co, WI] co-op observer reports SNOW of M6.0 INCH at 07:00 AM CDT -- storm total through 7am. (7:27:37 AM) nwsbot: Local Storm Report by NWS MKX: Beloit [Rock Co, WI] co-op observer reports SNOW of M3.0 INCH at 07:00 AM CDT -- storm total through 7am. The snow & sleet this morning is a hard pill to swallow considering one week ago we were forecasting highs in the low to middle 70's. Now, nearly three inches of snow has fallen with more to come. A Winter Weather Advisory will continue through Noon today, with the heaviest of snow falling during the morning rush hour. With the heavy snow falling now, snowfall rates of one inch per hour will be possible through 8am. 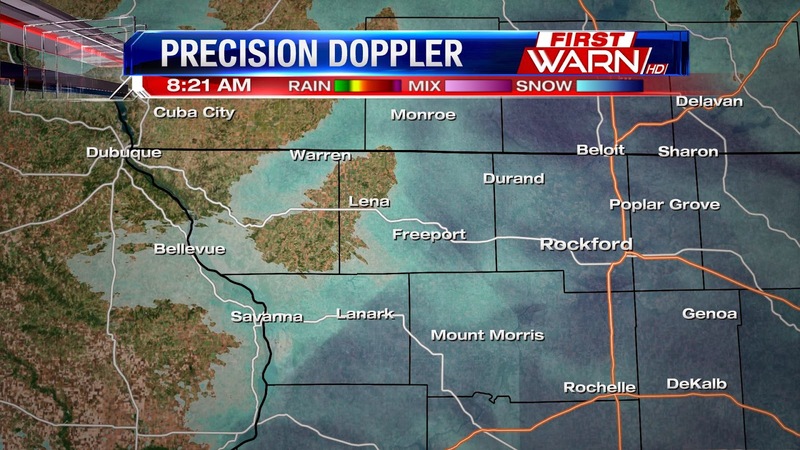 Low pressure near the Quad Cities is responsible for the snow this morning, and snow and sleet mixture a little further south and west of Rockford. 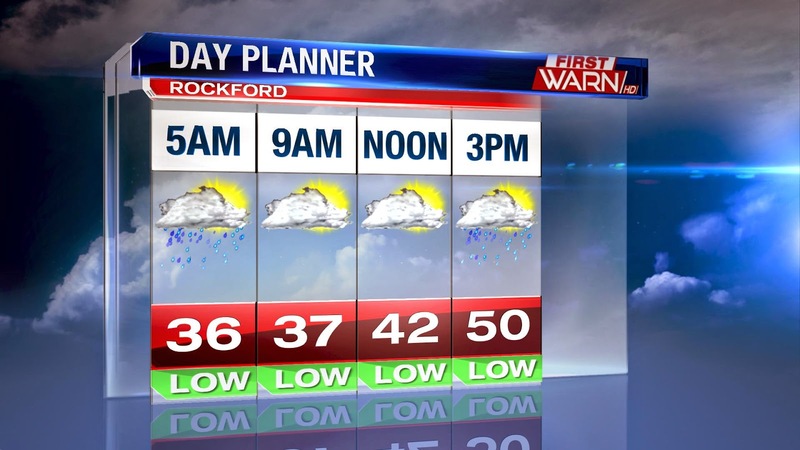 The snow will be wrapping up after 10am, with most of it east of Rockford by Noon. Totals near 4", or slightly higher, are not out of the question. The commute this morning will be very slow as roads are snow covered and slick. It's going to be hard for plows to keep roads clear as long as the heavy snow continues to fall. Also, winds are increasing from the east which has lowered visibility to under half a mile in many locations. 10:30PM UPDATE DATE: While the majority of the snow has stopped across the area, we aren't done with it yet. More moist air will work into the area late tonight, and more snow will move in from the north west around 2am. Ground temperatures are on the warmer side and that will help to keep the snow from sticking, but with snow falling moderately to heavy at times this will allow for some accumulation. You can expect about 1-3" by late Monday morning. With the snow falling during the commute time you can expect a slow go, especially when a more moderate band moves through, because this will cause visibilities to drop. The snow will end around lunch time tomorrow, next system moves through for Tuesday bringing rain and possibly a rumble of thunder. 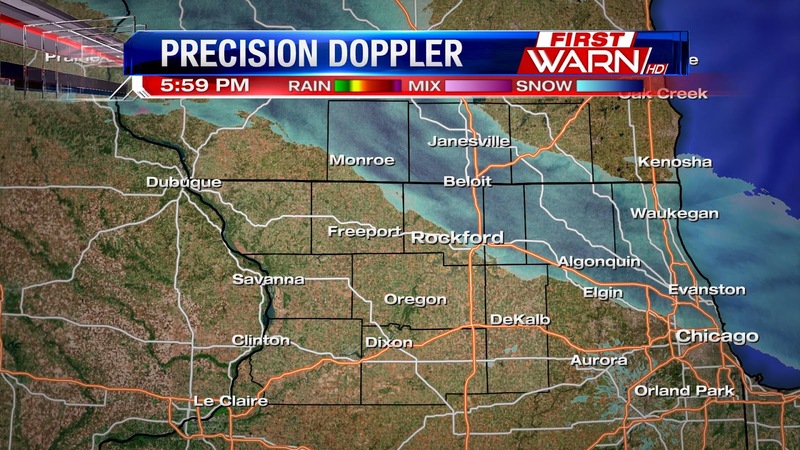 UPDATE: Snow will continue to sink towards the south and into the Rockford area later tonight. The snow will fall more moderate tonight and could become heavy at times. The more moderate snow looks to move in around midnight. Because of the more rapid snow rates, accumulations around 2 - 4 inches will be possible by Monday morning. 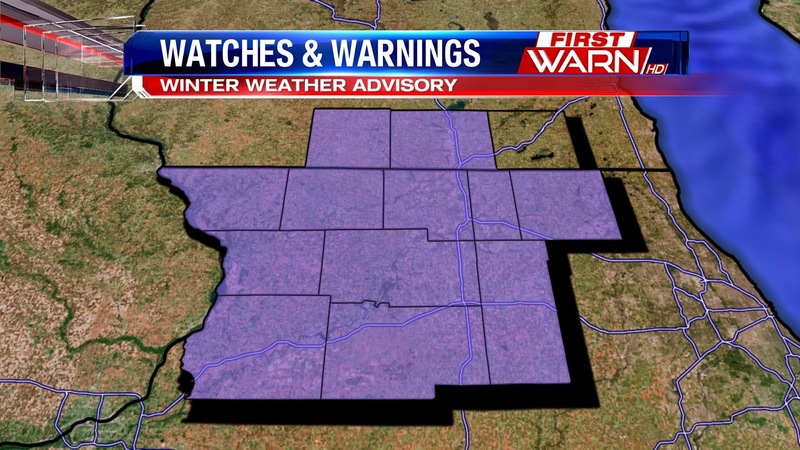 UPDATE: Jo Daviess and Stephenson counties have been added to the Winter Weather Advisory, which goes into effect at 1am Monday morning. 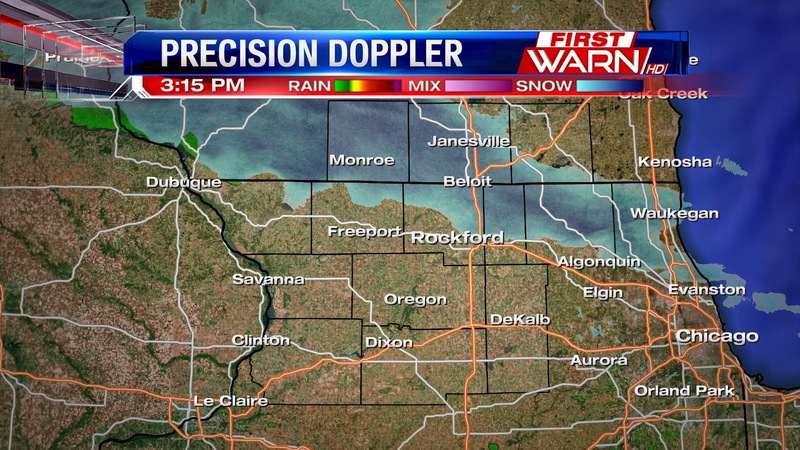 Current radar check, you can see the snow still just north of the Rockford area, with more moderate snowfall in portions of southern Wisconsin. UPDATE: Winter Weather Advisory will go into effect for Winnebago, Boone, and Ogle counties tonight at 3am through Noon Monday. A Winter Weather Advisory is in effect for Green and Rock counties in southern Wisconsin now through Monday morning at 8am. Snow will continue to fall tonight and taper off by Monday morning. The snow fall will be moderate at times and could reduce visibilities, so make sure to use caution as you're heading out tonight and tomorrow morning. Though the snow is ending Monday morning, it's still going to be a messy commute for the start of the work week so make sure to leave a little extra time as you head out the door. 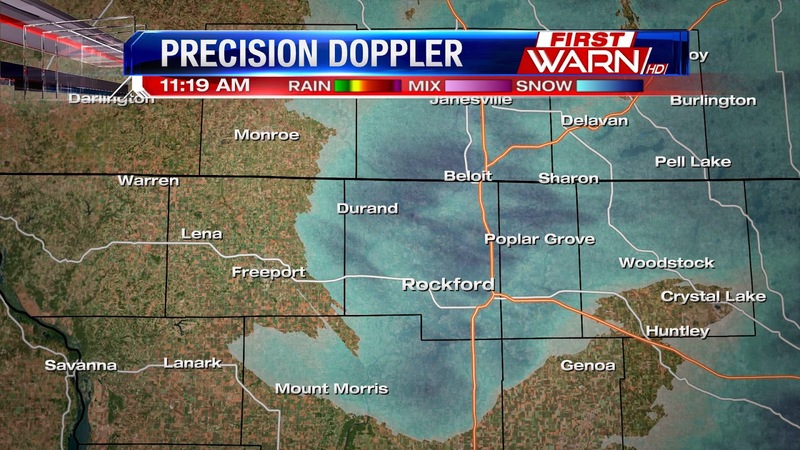 The snow now is currently moving southeast through Monticello and Monroe, extending through Beloit, Roscoe, and Woodstock, just north of Rockford. That was one of the headlines that came out earlier this week from NOAA's National Climatic Data Center. Every landmass across the globe registered above average temperatures, with the exception of parts of the Great Lakes, East Coast and deep south. The average temperature for both global land and ocean surfaces was 1.42°F above the 20th century average. 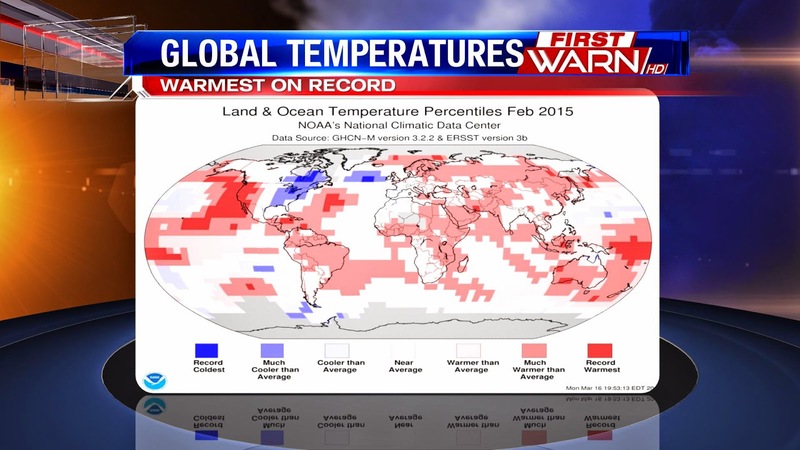 This makes the winter of 2013/2014 the highest on record since record keeping began in 1880. Friday marks the first day of spring, and it will surely feel like it! Sinking air moving in behind an area of high pressure will allow the morning clouds to decrease, the sun will come out and temperatures warm into the mid and upper 50s. But, will the first full weekend of spring feel like it? The answer to that is 50/50. A cold front will drop south from the north late Friday night. 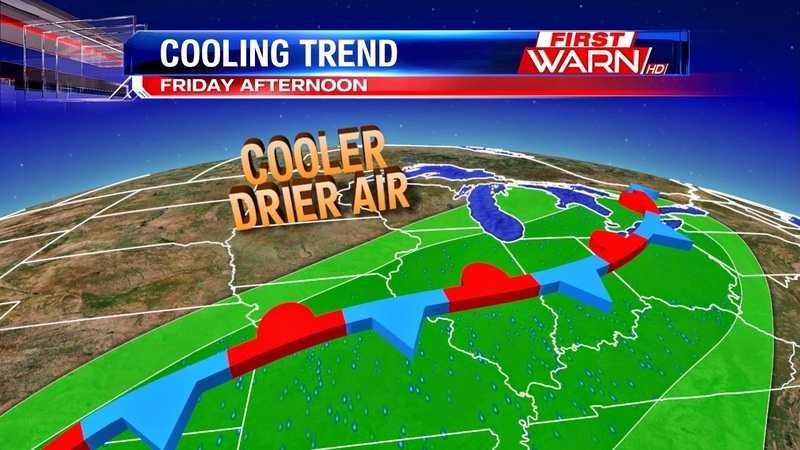 The front will come through dry but will bring in much cooler air. However, the air looks to slowly move in so it's possible to get another 50° day from Saturday before temperatures crash later in the afternoon. An area of low pressure develops near the back end of the cold front over the Plains. That's the low we're keeping an eye on that could bring another taste of winter by the end of the weekend. The track of the low will help to determine if we see any flurries mix with the rain as that system moves closer. Cold air will already be in place, so we could see a rain and snow mixture. If the low tracks farther north it will help keep the colder air north as well. However, if it tracks a little further south, we may have a slushy & messy Sunday night. We do see the 50s again, but the middle of the week, also another shot at some rain comes Tuesday night into Wednesday. The last time any measurable precipitation fell was back on March 3rd when 2.5" of snow came down. After that, it's been bone dry and that's starting to cause a bit of a deficit in northern Illinois and southern Wisconsin. Snowfall for the month is almost an inch behind, and overall precipitation is just a little over 0.80" below the monthly average. While it might not sound like much, we don't want to start running dry too soon in the season because there could be impacts on spring planting and soil moisture recharge. It does look like there will be at least a dent put into the dry stretch late this weekend and into next week. The chance for both snow and rain are in the 7-day forecast. A rain/snow mix is possible late Sunday into Monday of next week, with rainfall possible for next Wednesday. Hopefully you got to head out last night and get a glimpse of the Auroras or Northern Lights last night. A fairly large solar storm impacted the Earth early Tuesday morning and then again in the evening. The strength of the storm brought the viewing range of the the Auroras closer to home and some in southern Wisconsin got to see the beautiful greens and pinks from them. 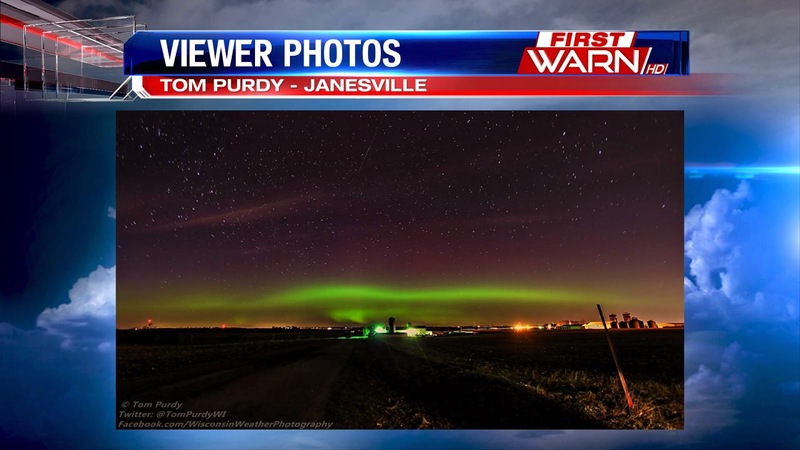 This picture is courtesy of Tom Purdy of Wisconsin Weather and Photography. He shot this photo early yesterday evening close to Janesville, Wisconsin! Such a beautiful photograph of a wonder phenomenon, did anyone else get to see them? If so send your pictures to weather@wtvo.com, I'd love to post them! The northern lights, or Auroras, are something we don't normally get to see across the Stateline, but tonight it is possible we will get a shot to see them! Auroras across the globe could be extra bright tonight due to a severe solar storm that is impacting Earth. Large geomagnetic storms have the ability to mess with the magnetic field of the Earth, and can even cause power outages. Some viewers got a great show early this morning in places like Wisconsin, Iowa, Minnesota, and North and South Dakota. The red area that covers the majority of Illinois would be the viewing area if a very strong flare hit, ranked at Kp9. The yellow represents a solar flare strength Kp7, and the green at Kp5. However, it is very difficult to forecast for space phenomenon and hard to tell how far south the Northern Lights will be visible. We do have nice viewing conditions to see them tonight, though with mainly clear skies and light winds. 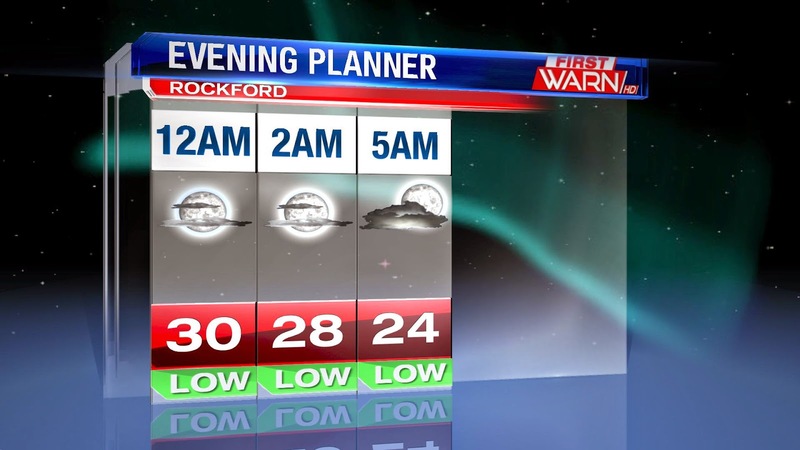 Temperatures will be a little chilly though with lows in the mid 20s. If you decide to try and check out the Northern Lights tonight, try and get away from the city lights and any light pollution. The lights were very visible this morning from 3am to dawn, so that might be a good shot to see them tomorrow morning. Make sure to look north in the sky, and if you aren't seeing anything try setting up a camera with an open shutter. Typically it can see the fainter lights that our eyes normally can't see. 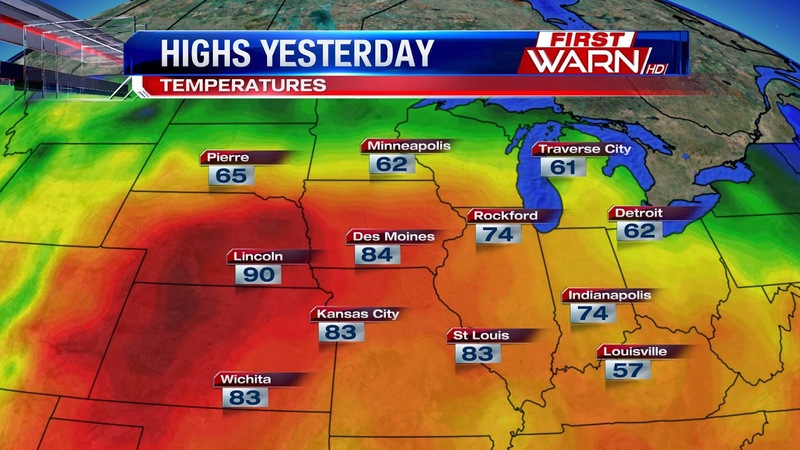 Near record setting highs were felt across the Midwest Monday afternoon. Temperatures closer to home reached the middle 70's, with the 80's not that far away. Definitely felt like late spring! That feeling will be no more with a cold front that came through Monday evening. Temperatures Tuesday morning have fallen into the 30's, with wind chills in the low to mid 20's. While it's not a major cool down, and actually closer to average than what the temperature was Monday, it's still a bit of a shock to the system. Especially coming off of a 60 degree stretch. High temperatures today will climb back into the middle 40's for the afternoon, and then drop into the 20's by Wednesday morning. Looks like we'll add up the 40 degree days before reaching the 50's by the first of spring. Mostly cloudy skies tonight and south west winds will allow temperatures this evening to stay very comfortable, only falling back into the mid and upper 40s. Winds will be gusty at times this evening due to a stronger pressure gradient. This is created because the Stateline area is sandwiched by two different systems; a high pressure to the south and a low pressure system to the north. The mild evening tonight, along with south west winds tomorrow will allow for a very spring like afternoon tomorrow. Strong warm air advection tomorrow will allow the Stateline to tap into the warmth that's been building over the plains through the weekend. While temperatures won't hit 80° like they did a little farther west, 70° is in the realm of possibilities tomorrow. We've done a lot of warming over this past week, and that has really helped eat away at the snow depth not only locally, but throughout the Midwest. 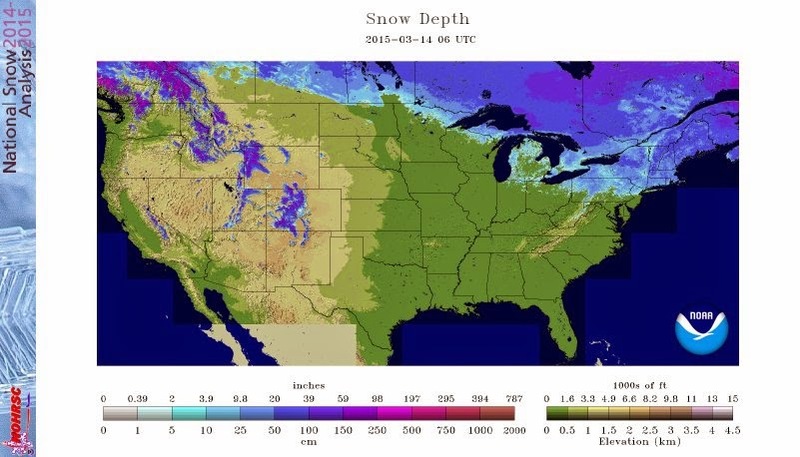 Just look at the current snow cover map today versus where snow was still on the ground last Saturday. Quite impressive! Over the next several days, we'll continue to melt away whatever snow piles remain left on the ground. Hopefully there will be no late season snowfalls to deal with towards the middle or end of the month. First 70 degree day of 2015? It's possible! Unseasonably warm air continues to dominate the Plains, Midwest and Great Lakes. A nice welcome after the cold February we had. Temperatures throughout the Plains will rise into the 70's and close to 80 degrees Sunday afternoon. While it won't get that warm here, we could get close to 70 degrees on Monday. A strong cold front will sit along the U.S/Canadian border Sunday afternoon. Temperatures through the Dakotas and central Plains will rise close to 80 degrees Sunday, while we'll remain in the low to mid 60's. An increasing wind from the southwest will take the air mass that will be in the Plains Sunday, and shift it a little further east for Monday. This means that high temperatures on Monday have a good shot of reaching that 70 degree mark. Now, before we go breaking out the shorts and tank tops, there are a couple wrinkles that may prevent us from getting that warm. First, the timing of the front. Most forecast models keep the front far enough north Monday to allow for the warm up. However, if the front were to move through during the afternoon rather than evening, temperatures would remain in the 60's. Second would be cloud cover. More clouds means less sun. This would also keep highs slightly cooler. Either way, Monday will be our last warm day as temperatures fall back near average for St. Patrick's Day. Skies are starting mostly cloudy this morning as rain moves through central and southern Illinois. 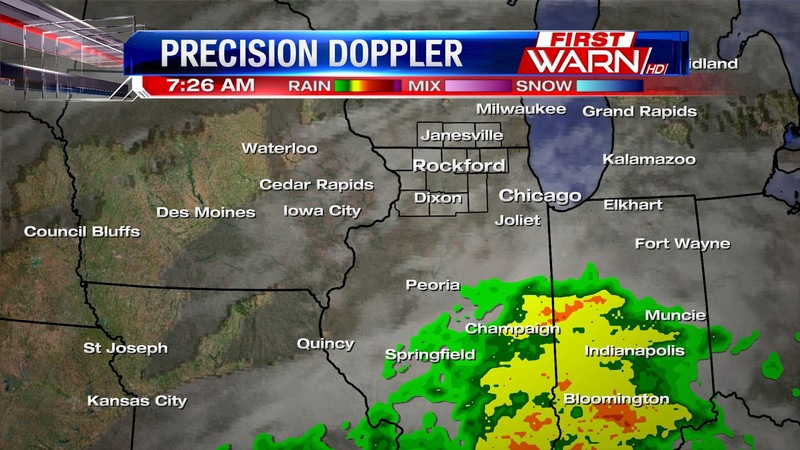 While the rain will not impact us today, the cloud cover will last through the morning and early afternoon. South winds in Iowa have pulled in a little more moisture, leading to fog in central and eastern Iowa. Some of that fog and haze will move east as surface winds shift around to the south this morning. Don't worry, dense fog is not in the forecast, but you will notice the clouds having a more hazy look to them through the morning commute. Especially for areas from Monroe to Freeport, Lanark, Shannon, Polo, Elizabeth, Stockton, Scales Mound and Leaf River. Temperatures today will climb into the upper 50's and low 60's as skies clear this afternoon. Tropics to blame for the warm-cold winters? Professor Dennis L. Hartmann of the Department of Atmospheric Sciences at the University of Washington in Seattle wrote a very interesting article found on Climate.gov earlier this week. In it, he discussed how the tropics could be the main reason behind the warm-cold split found over North America during the recent winters. His guest post is found below. It should be noted that this topic is one that many scientists with NOAA are currently exploring, and that this post contains the opinion and idea of Professor Dennis L. Hartmann. 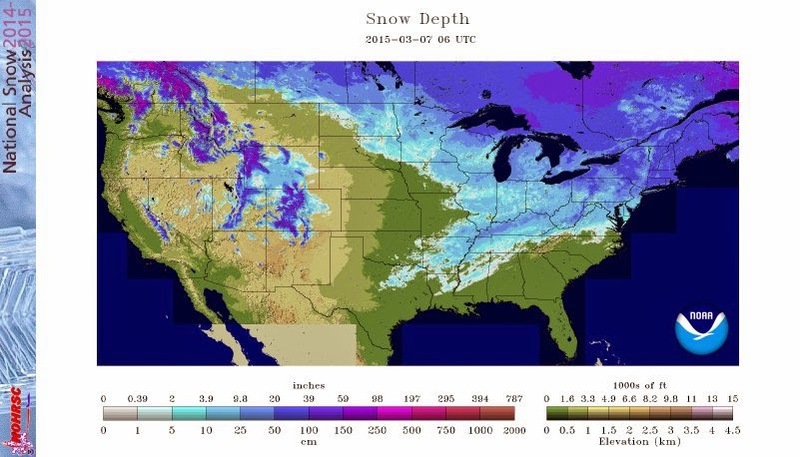 So far this winter it has been warm and dry in the West and cold and snowy in the East. As I write from Seattle, it is sunny and in the mid-fifties, and the Olympic Mountains have very little snow on them for late winter. Meanwhile it is 25°F in Chicago, and Boston is bracing for another snowstorm that might bring their total closer to the snowiest season on record. 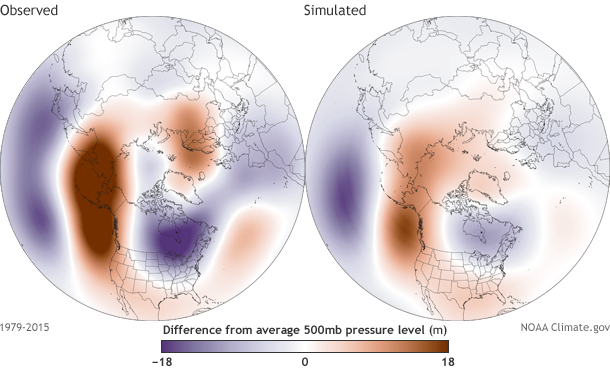 Figure 1 shows the circulation anomalies (departures from average pressure as measured by the 500hPa geopotential height field) for the winters of 2013-14 and 2014-15, so far. Over the Pacific and North America for both winters, this pattern favors warm and dry in the West and cold in the East, with some differences in details. People have speculated that this weather ‘weirding’ might have to do with global warming, either through the Arctic Sea Ice decline (Francis and Vavrus 2012), or through warming of the tropical oceans (Palmer 2014; Wang et al. 2014). I will argue here that these anomalies can be seen in past patterns of natural variability, and are likely caused by sea surface temperature changes in the tropics. I will not address the question of whether the probability or intensity of this pattern might be influenced by global warming. 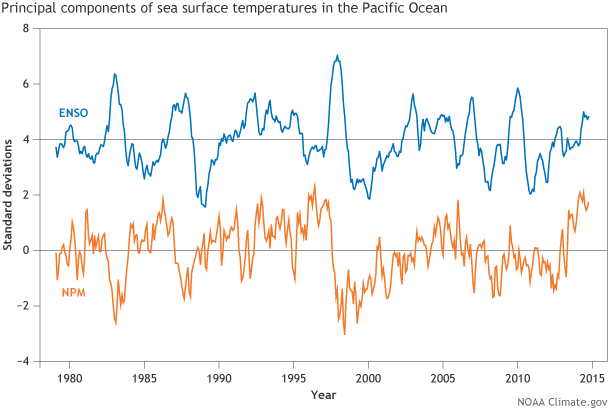 The two most common sea surface temperature correlation patterns in Pacific Ocean north of 30°S over time, based on EOF analysis. The first is the classic ENSO signal, while the second is the North Pacific Mode. The contour interval is 0.1, and the zero contour is white. Red and blue show correlations between anomalies of opposite sign. When red areas have above-average SSTs, blue areas have below-average SSTs, and vice versa. See Hartmann (2015) for regression plots in units of ˚C. While ENSO accounts for much of the tropical ocean-atmosphere variability that dominates climate from year-to-year, classic ENSO indices do not account for everything. In addition to the classic ENSO signal of sea surface temperature (SST) variability, decadal signals of SST variability exist that exhibit strong coupling between the tropics and higher latitudes (Hartmann 2015). Figure 2 shows the two most important patterns of SST variability for the Pacific Ocean region north of 30S. The first of these is the classic ENSO pattern, while the second can be called the North Pacific Mode (2)(3). The North Pacific Mode pattern consists of above-average SSTs in the western Tropical Pacific that extend north along the California coast and across the far northern Pacific Ocean. 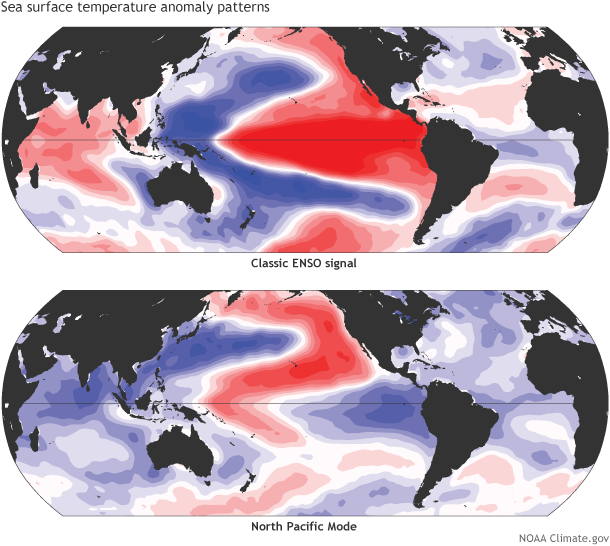 It is thus a pattern of natural variability in the coupled ocean-atmosphere-land system that connects the tropical and middle latitudes. While ENSO has been in a neutral state for the past few winters, the NPM has been in an extreme positive state since the summer of 2013 (Figure 3). Monthly time series of ENSO (top, blue line) and North Pacific Mode (NPM) (below, orange line) in the Pacific Ocean north of 30°S from January 1979 to January 2015. Units are in standard deviations from the mean. The NPM has been highly positive since the summer of 2013. Graph by Fiona Martin, based on data provided by Dennis Hartmann. The North Pacific Mode SST pattern (Figure 2 bottom) is associated in the observational record with a 500hPa height anomaly pattern that looks very similar to the seasonal anomaly pattern from the winters of 2013-14 and 2014-15, with a ridge along the Rockies and a deep trough over the middle of North America (compare Figure 4 (left) with Figure 1). This pattern brings warmth and drought to the West and cold to the East, as we have observed the past two winters. Of course, it’s possible for the patterns of SST and 500hPa height to be associated—to occur at the same time—without one being the cause of the other. But by using the observed SST under atmospheric models and performing many test simulations of the period from 1979 to the present, it can be shown that the SST anomalies associated with the North Pacific Mode do drive the “downstream” pressure anomalies over North America (Hartmann 2015). Figure 4 (map on right) shows that the simulated 500hPa anomalies produce a pattern that is very much like the observed one (compare Figure 4 left and right) (4). We therefore know that the SST anomalies in the Pacific were a prime cause of the “Polar Vortex” winter of 2013-14. Since the SST anomaly pattern persisted into this winter (Figure 3), it is reasonable to suppose that the SST anomalies are also contributing to the warm, dry West and cold East anomalies experienced so far in 2015. Regression analysis showing pressure anomalies associated with variability in the North Pacific Mode since 1979 (from Figure 2). Observed 500hPa height anomalies during the positive phase of the NPM, based on NCEP reanalysis data (left). Simulated pressure anomaly patterns from models (ESRLv2 50-member model ensemble) forced by sea surface temperature patterns derived from the same NPM time series (right). Maps by NOAA Climate.gov, based on data provided by Dennis Hartmann. Based on many observational and modeling studies, we know that seasonal anomalies in SST and weather in the midlatitudes can be driven by tropical SST anomalies. The tropical ocean area is large, and the atmospheric heating is sensitive to tropical SST anomalies (Lau and Nath, 1994). My colleagues Paulo Ceppi at the University of Washington and Peter Watson at Oxford University have run some initial model experiments indicating that the observed SST anomalies in the tropical Pacific Ocean cause the extratropical height anomalies of the winter of 2013-14 in models. We therefore believe that the anomalous weather in North America during the winters of 2013-14 and 2014-15 is related to the warm SST anomalies in the western tropical Pacific (as part of the North Pacific Mode pattern shown in Figure 2), which have persisted since the middle of 2013. Although the North Pacific Mode is known to be a product of natural variability associated in some way with ENSO, this mode of variability has become more prominent since 1979. Whether the enhanced importance of this mode is related to natural variability, global warming, or just changes in observing systems, is, I think, unknown at this point. The CMIP3 and CMIP5 global warming simulations (5) move toward a more El Niño-like state in the eastern equatorial Pacific where, on average, the models warm the SST more than in the tropics as a whole. The models are not in agreement on this, however, and there is low confidence in changes in the intensity and spatial pattern of El Niño in a warmer climate (Christensen et al. 2013). Meanwhile, a major El Niño has not occurred since 1998, but some strong La Niñas have (Figure 3), so that nature has moved more toward a La Niña state over the past 15 years. So while we are fairly sure that tropical SSTs are the apparent cause of the unusual nature of our past couple of winters, we do not know for sure whether this is just part of the natural variability of climate, or whether climate change is favoring the positive phase of the North Pacific Mode of SST variability. (1) The most common patterns are determined by EOF analysis, which is short for Empirical Orthogonal Function. EOFs are statistical ways to identity the pattern and time series that is associated with the largest amount of variability. The pattern that is associated with the largest amount of variability is often referred to as EOF/Principal Component-1 or as the leading pattern of variability. This analysis used standardized data. (2) I have used correlation patterns here rather than regressions showing temperatures in degrees to better reveal the connections to the tropics, where small changes in temperature can be more important because the temperature is already high and the highest temperatures are “felt” by the global atmosphere. In other words, we want to look at the strength of the relationship between SST in different locations more than the actual amount of the temperature variation involved. (3) The North Pacific Mode (NPM) described here is distinct from both the Pacific Decadal Oscillation (PDO) and the El Niño-Southern Oscillation (ENSO). The NPM is often in its positive phase as shown in Fig. 1b just prior to an ENSO warm event, but not always. It is related to the ‘seasonal fingerprinting’ mechanism (Vimont et al. 2003) whereby tropical-extratropical interactions can set the stage for El Niño. (4) The degree of similarity between the simulated and the observed patterns is determined objectively by applying a regression of the simulated 500hPa anomalies onto the time series of the observed NPM SST model. The modeled response is a little weaker and is missing some components in the far north, but the structure of the wave train that affects the United States is well simulated by simply specifying the observed SST. (5) CMIP stands for the Couple Model Intercomparison Project and studies the differences in coupled atmosphere-ocean general circulation models. CMIP3 refers to the third phase of the project and was used as new data in the IPCC Fourth Assessment. CMIP5 is the fifth and most recent set of simulations that was used for the IPCC Fifth Assessment. Complete article, along with references, found here. Moving on up! Congratulations Brandon! !